Oh my starzies, couldn't we all just use a little more love these days? This year, Valentine's Day shouldn't only be about loving your significant other (if you have one); let's make it about spreading love and good-for-you moments to others. Loving our children. Loving our neighbor. Loving ourselves. Who's with me?!? These Blueberry Bliss Bites take snacking to a whole new level! Featuring items you can find at your local Safeway, like Nature Valley™ oat granola bars (now easier to bite! ), dried blueberries, raw cashews, and a variety of omega-3 packed seeds --- this is a snack that is uber nourishing and will truly satisfy! I don't know about you, but Babycakes and I come home from school ravenous. This red, white, and blue bruschetta is a perfect appetizer for your 4th of July celebration --- be it a big barbecue with friends, a picnic by the lake, or appetizers on a blanket before the fireworks. It's beyond delicious, and seriously... how cute is it served in a half watermelon bowl?! 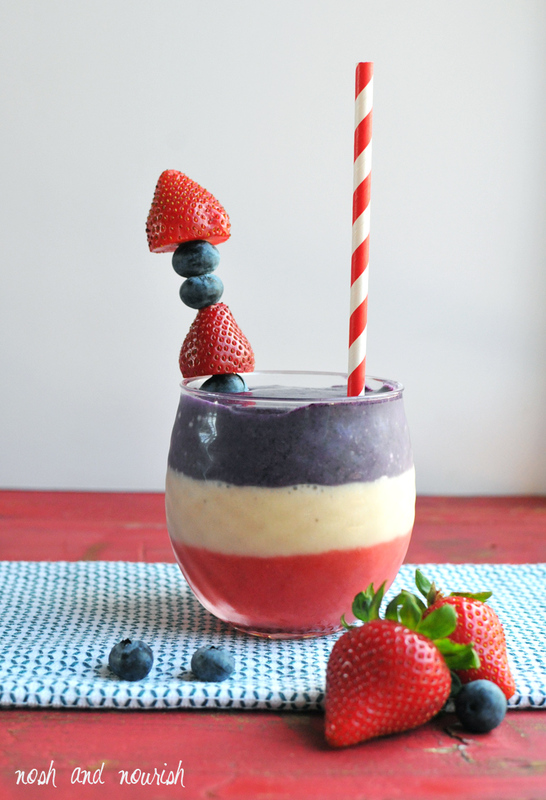 This patriotic layered smoothie is totally perfect for the 4th of July, Memorial day, or any morning you just want to be a little fancy! It's super healthy, super refreshing on a hot day, and super delish!